I am an iPhone addict. I admit it. And I’m a big fan of the games that Chillingo publishes. Their titles probably take up more space on my iPhone than any other publisher’s. 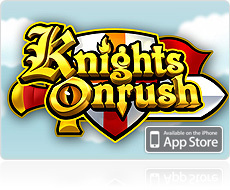 Knights Onrush is a gesture based castle defense game. You are the king of the castle and have to defend it from an onrushing hoard of villains, from knights to ghosts to leaping something-or-others. You defend your castle by using your finger to literally flick the little bastards up in the air, where, you hope, they’ll come down with a thud and a splat. You can improve your defense by upgrading your castle. There are two currencies at work in the game. Gold and Souls. You get gold from killing your enemies. You get souls from sacrificing your enemies in a fire pit or offering them up to a dragon. As your wealth mounts, you can acquire crushing columns, smashing boulders, cannons, ballistas, and, my favorite, a flame thrower. The game has a very challenging quest mode and a free play mode, so there is plenty of replay value. My only gripe is that you can develop some serious hand cramps trying to flick all the little buggers off the screen.